A recent announcement that Azure backup was now supporting desktop operating systems I believe is a very important step in the on going move to cloud based solutions for many reasons. 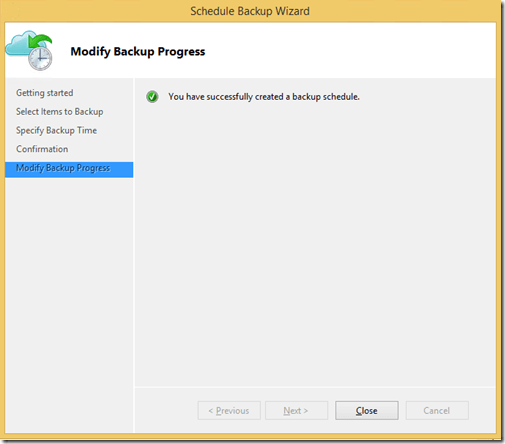 but what I thought I’d do is step you through setting up Azure backup for a desktop machines. 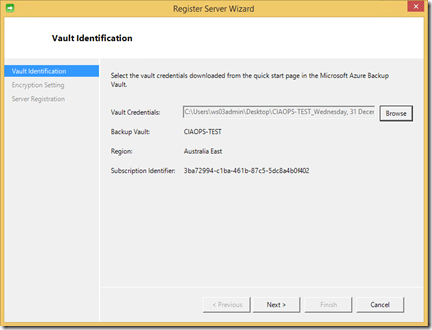 The first step is to login to your Azure management portal and create a backup vault if you don’t already have one. You can, of course, create as many different vaults as you desire. Why would you do this? You may want a vault hosted in different data centre, or maybe you want different vaults to separate data. 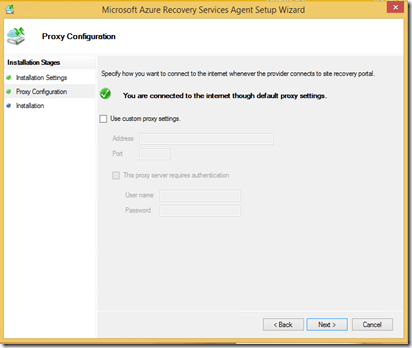 Once you have logged into you Azure portal locate the Recovery Services option on the left and select it. 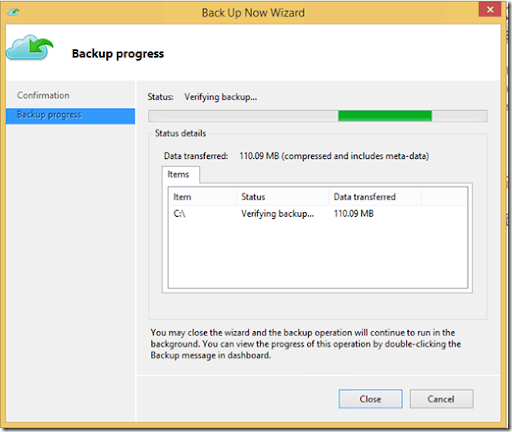 This will show you whether you have an existing backup vaults. In this case we want to create a totally new vault so select the New button in the lower left of the window. 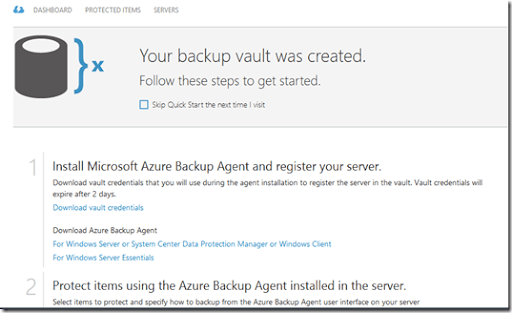 Now because you had already navigated to Recovery Services in the main Azure portal you will automatically be shown the correct location to create a new Backup Vault as you can see above. 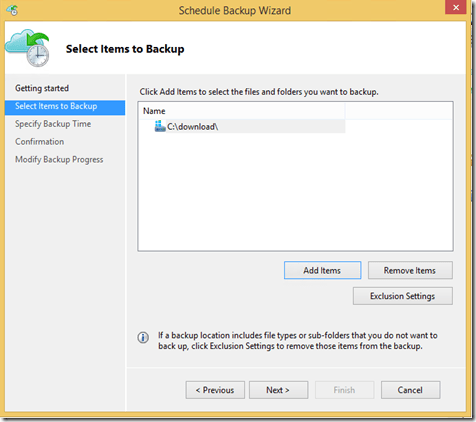 To continue, select Backup vault from the two options in the middle. You’ll now be prompted to enter a name for your new vault and a data center in which the vault will be located. Once you have completed these options select Create Vault in the lower right of the window. 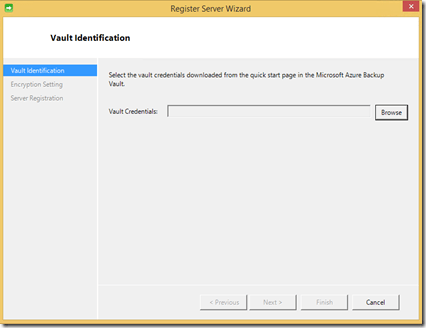 You should now see the vault being created in the Azure console. Once the new vault has been created if you select the vault name in the Azure portal you will be taken to information about the new vault. Here you will find links to download the vault credentials and the agent for the workstation. We will need to access these from the workstation (or server) we wish to backup). I you select the Servers option at the top of the page you will see that no servers are currently registered with this vault. That is is no devices are backing up into this vault currently. 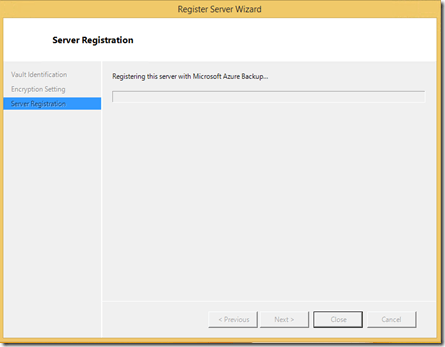 To change this, log into the Azure portal on the machine you wish to backup. 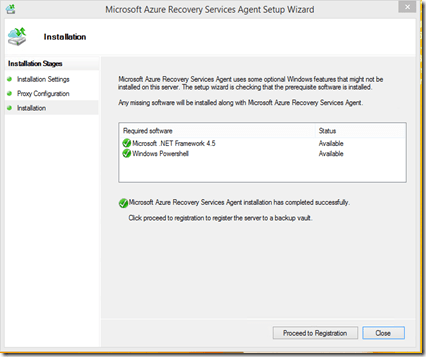 Once you have logged into the Azure portal on the client machine, select Recovery Services and then select the Backup Vault name you just created. You should see the screen above. From here, select the link to Download vault credentials. This will prompt you with a file to download. Select a location on your client computer to save this file. With that complete select the link to download the appropriate client for the machine you are on. In this case it will be the first link since we are installing onto a a Windows 8 desktop. This will again prompt you with a file to download and save. Do so and then run this download, which is the backup client. Immediately when the agent runs it will check your system to ensure it has all the required software. If it doesn’t it will download and install what is required as shown above. You’ll then be prompted for a location to install the programs files as well a location of the backup cache. Once you have made any desired changes here select the Next button to continue. You’ll then be prompted to enter any proxy details. In most cases there won’t be a proxy so you can press the Next button to proceed. You’ll now be prompted about any Windows features that may be required. In most cases these will already be installed so press the Install button again to proceed. 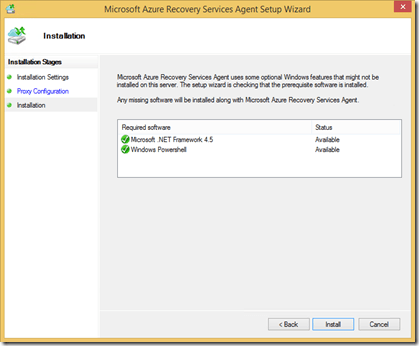 The Azure backup agent and any prerequisite software will now be installed. When the installation has completed you can simply close the installer or register your machine and set up a backup. To do this select the Proceed to Registration button. The registration wizard should now commence. The first step in this process is to locate the vault credential files you downloaded previously to your workstation. To locate the vault credentials select the Browse button and locate the file on your system. Once selected the credentials will be verified (they do expire after a few days so it is always a good idea to this registration process immediately). You can see that all the information matches the Backup Vault created previously so select the Next button to proceed. The next step is to enter a passphrase to protect the backed up information on this machine. In most cases the best practice is to select the Generate Passphrase button to create a complex and secure passphrase for you. “If your passphrase is lost or forgotten, the data cannot be recovered. 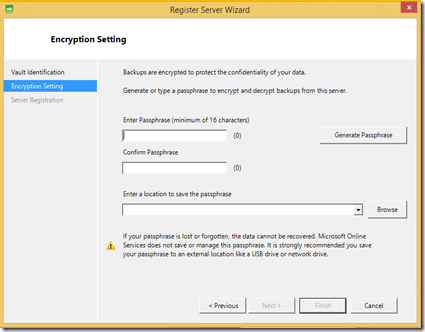 Microsoft Online Services does not save or manage the passphrase”. 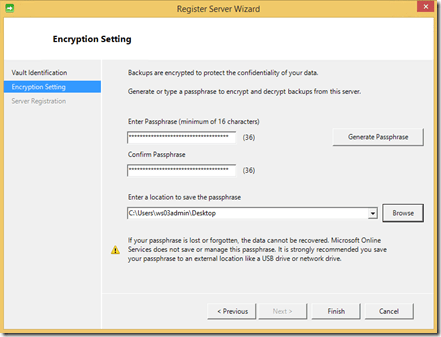 So ensure you save that passphrase file somewhere (not only on the backed up machine!) secure because you are going to need it! Select the Finish button to continue. 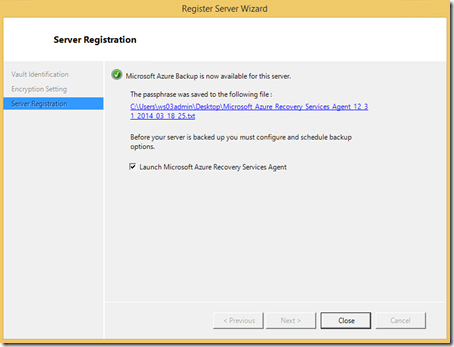 The server will now be registered with Azure Recovery Services. 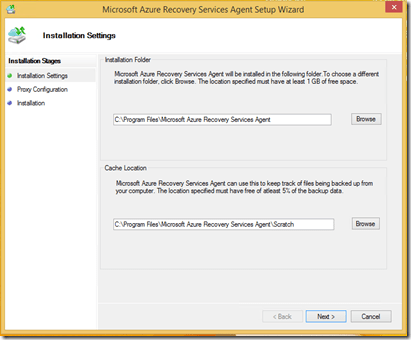 When the process is complete, leave the Launch Microsoft Azure recovery Services Agent option checked and select the Close button. 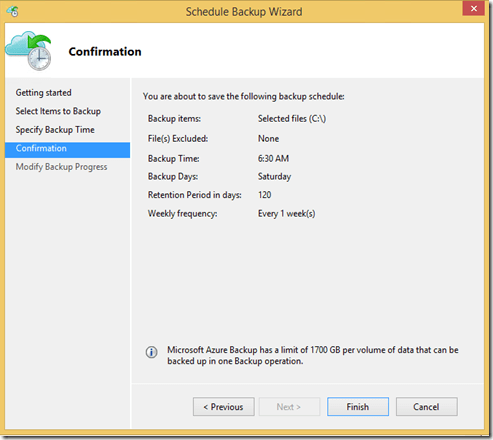 The Azure Backup should launch as shown above. 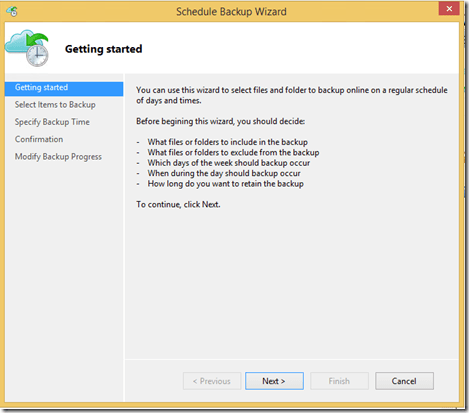 To create a new backup job select Schedule Backup in the top right of the window. Select Next at the Getting Started screen. Use the Add Items, Remove Items and Exclusion Settings buttons to configure the information from the machine you wish to backup. When configuration is complete select the Next button to continue with the wizard. 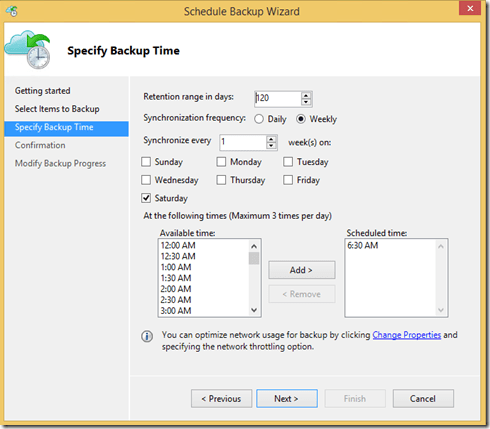 On the next screen select the time and regularity for the backup to execute as well retention range. If everything appears correct at the conformation screen select the Finish button. When the schedule has been created successfully press the Close button to complete the process. The console should now report that a backup job has been scheduled as shown above. 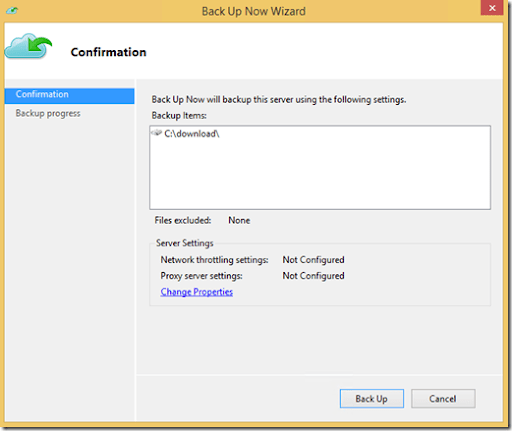 If at anytime you wish to run the backup simply select the Back Up Now option in the top right Actions area. Then select the Back Up button to commence. 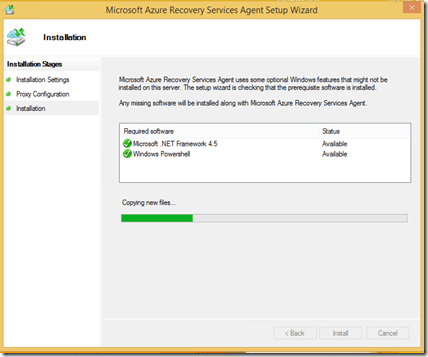 So that is easy it is now to backup a Windows client (and server) to Azure. If you look back in the Azure portal on the Servers option for your Backup Vault you should see the machine you just configured as shown above. I think that by extending Azure backups to Windows clients Microsoft has made a very smart move. I would urge IT Professionals and resellers to take a close look at Azure backup, especially of desktops, as I believe it is going to have a major impact on the industry. This is only the first towards something much bigger in my books which I’ll speak more about in an upcoming blog post. I can also see the day when every Windows machine and potentially mobile device will automatically backup to Azure without any additional cost, given how cheap web storage is these days! 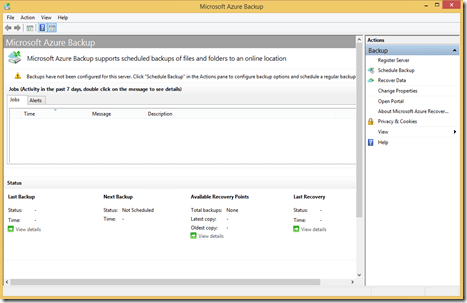 Look out for more posts on Azure backups including how to restore and the differences between Azure backup and what you are doing now. 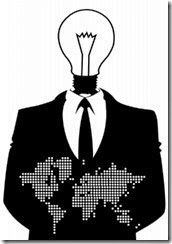 I am honoured to be part of the Globalization of SMB webinar series conducted by Karl Palachuk. I will be featuring on the next episode on Tuesday the January 27th from 0AM Pacific time live (that is 4am here in Sydney Australia). but they will all be recorded for your listening and viewing pleasure after the fact. You can listen to the first episode featuring Harry Brelsford right now. I’ll be aiming to provide my experiences and thoughts on how globalisation has changed all business, especially technology and especially the SMB space and how that trend is only accelerating. If you have any questions you’d like me to answer during this session please send them to me at director@ciaops.com or @directorcia. I look forward to seeing you at the event. For this episode I’m joined by Chip Reaves from Bigger Brains to discuss a number of topics. Chip shares his experiences around his involvement with Computer Troubleshooters. We also spend also discuss his current venture of video training and finally we recap his recent video interviews around the future of the MSP business with some industry thought leaders.